Jizo-bon(地蔵盆) is an festival held to celebrate Jizo(地蔵, Ksitigarbha in Sanskrit) on August 24th in Kansai Region. Jizo is also regarded as the guardian of children, so the festival is dominated by children. 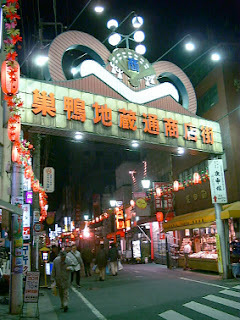 The festival is prevalent in Kansai Region including Kyoto and Osaka, but it's unfamiliar to me living in Kanto Region. Worshipers cleanse away, dress a Jizo statue and make offerings of food and flowers to him. Confections of the offerings are handed out to children. They enjoy playing games and holding a lottery and performing the Bon dance. It's the largest event in summer vacation for children. 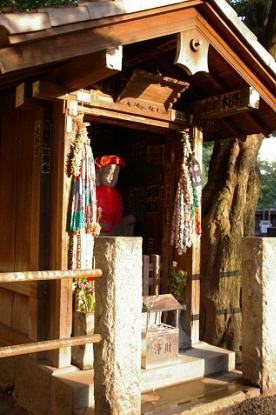 Ancient people associated Jizou with a belief in a travelers' guardian deity, so its statues are located to hornor it by roadsides around Japan. Six Jizo statues along the road in an area near Sakae Village in Nagano Prefecture became hot topics this year. The quake(M6.7) with a seismic intensity of a upper 6 on the Japanese scale of seven struck the village at 3:59 a.m.(Japan time) on March 12th. Shortly after the quake, two quakes of level 6 on the Japanese scale hit the village at 4:31 a.m. and at 5:42 a.m. on the same day. No building collapsed following the first quake. After villagers evacuated their homes, 33 houses were completely destroyed by the second and third quakes. Many houses, roads, riverside areas and farmland were also damaged. No one died of the quakes on the day. In April, the six of the seven Jizo statues in Nishiotaki area next to Sakae Village were found facing in the direction of the village. The seven statues were buried up to their necks in snow and the six of them were not fixed to the foundation stones on March 12th. So they are thought to have swivelled around to face in the direction of the village due to vibration of the quakes. 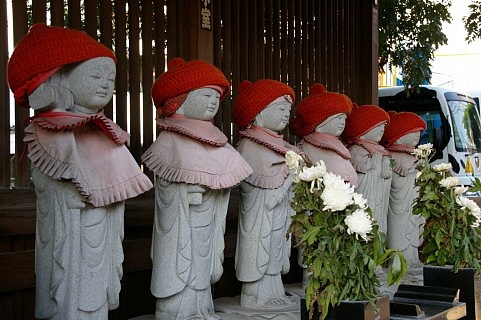 Some people said that the six Jizo looked in the village's direction with concern for the villagers. 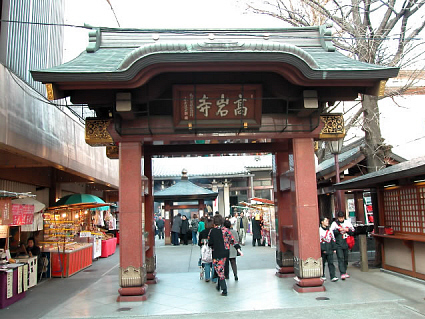 Koganji Temple(高岩寺) in Sugamo, Tokyo is commonly known as "Togenuki Jizo(とげぬき地蔵)" which means "jizo who removes spines." Its name derives from a legend. Mainly elderly people came to go to the temple to pray for cure of disease. the principal Jizou image housed at the temple is not shown to the public. Instead, the image of the Kannon bodhisattva called Arai Kannnon(洗い観音) attracts worshippers. It is believed that Kannon can heal the body's ills by washing the same part of Kannon's body as the affected part of the body. 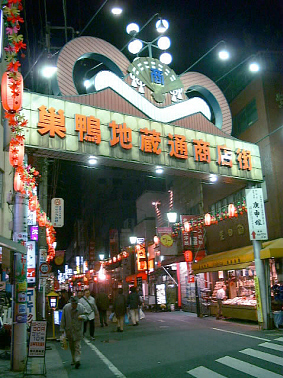 A shopping street has flourished as an approach to the temple. Now the street is called as "Harajuku for elderly women. "The street is filled with active seniors. Each side of the street is lined with old-fashioned and senior-friendly shops including clothing stores, coffee shops, specialty shops and cafes featuring Japanese-style sweets. The McDonald's outlet in the shopping street used to provide senior-friendly information on the menus. English words on McDonald's menu are converted into katakana in a way that maintains a very similar pronunciation. 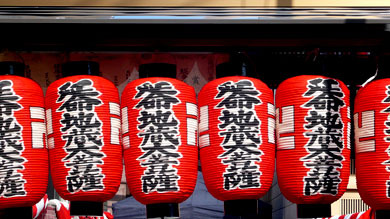 Katakana is the Japanese phonetic alphabet. Many elderly people have no idea what the dishes on the menu look like because they are not good at English and are unfamiliar with fast-food meals. Now the information are not provided, but the outlet is filled with elderly people.